On the 10th of February, Charles Snee the managing editor of the Linn Magazine found out the plausible counterfeits of the US stamps sold by different sellers on the well-know auction eBay. Charles Snee was following the track of possible postal stamps counterfeits since 2015, when he discovered on the postal stamps' forum that 'Love forever' stamps were falsified, so he paid attention to it. He revealed three eBay sellers who were featuring fake U.S. Forever Hearts (2015) stamps Scott 4955-56, and the Rose and Heart stamps (4959). Postal falsifications are made to take advantage of postal administrations, as we can see specifically U.S. Postal Service. In 2013, after the new edition the editors of Scott, started keeping accounts of U.S. postal falsification and they can be found in in the 'Scott Specialized Catalogue of United States Stamps and Covers'. 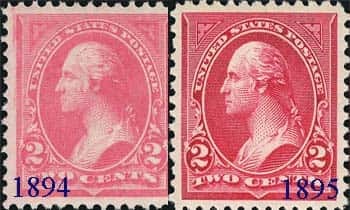 It was a needed step, because the faking of the postal stamps in the U.S. roots from 1895, the counterfeit of 1894 2 cents George Washington light rose carmine stamp from the 1st Bureau (Scott 250). The falsified copies of 2cent stamps were submitted to the Chicago Tribune advertising in 1895. The fake stamp issues were made in Chicago by Tinsa McMillan and worked off by the Canadian Novelty Supply Agency in Ontario. As a result McMillan and few of her colleagues were sentenced and put behind the bars. Lots of the stamp's falsifications that can be offered nowadays are marked 'C' by postal authorities. In 1992, in the 18 March issue of Linn's magazine Wayne Youngblood stated that there are 2 types of counterfeiting are known: the first with type I triangles in the corner (Scott 250 CF1) and with type III triangles (Scott 267). The editors of Scott have seen only one unutilized stamp of Scott 267 CF1, and it has no gum. Such type of falsification is quite rare, as most of the fake stamps were taken by postal authorities. If you are interested in finding more information about falsified stamps try to start from 'The Scott U.S. Specialized catalog' and then proceed to other sources. Also, try to learn books from Howard K. Petschel, a retired postal inspector from Sandpoint, Idaho. He is a real professional in this field and his writings are very profound and detailed, so this source is recommended for reading. Some of his works include: Spurious Stamps: A History of U.S. Postal Counterfeits, More Stamp Counterfeiting: The Perfect Crime, United States Postal Counterfeits Illustrated: Inked Print, and Stamp Counterfeiting: The Evolution of an Unrecognized Crime. If you want to read information from the collectors, pay attention to Joann Lenz,a keen collector of counterfeit stamps who shares information on her website. John M. Hotchner, from Linn's is a consultant for the Postal Counterfeits section of the Scott U.S. Specialized catalog.